This is my entry for the 52 Ancestors in 52 Weeks challenge, week 3: Tough Woman. 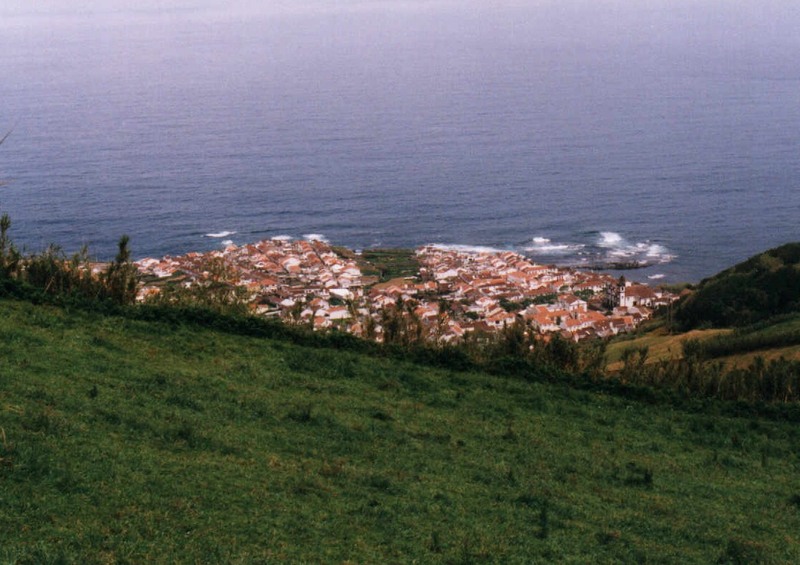 It’s not easy to flesh out the stories of Azorean women. You are dealing with baptismal, marriage, and death records. That’s it. Often, women are elusive because of naming practices which involved taking a religious name rather than a surname. A religious name that can change throughout their life. Rosa Jacinto Boteilho was born 24 Feb 1824 in the village of Maia in Ribeira Grande on the island of Sao Miguel. She was the daughter of Antonio Boteilho da Rocha and Antonia Leonor. Rosa married Felicianno de Mello (aka Felicianno Mello Castanho) 26 Oct 1840 at Divino Espirito Santo Church in Maia. He was 33. She was only 16. He was a soldier who had left the village for some time, but returned about 3 years prior. This is a photo of their village and how it looks today. To say that Rosa endured hardship is an understatement. Rosa had at least 12 children. As I’ve worked through the obitos (death records), I’ve seen those children die one by one. I’ve only worked in the 1860s and so far I’ve found 5 of her children have passed away before the age of 5. From what I’ve seen in the records, I suspect some sort of epidemic came through the village and affected children the most. One year there were over 100 deaths (usually 30-40 were normal) and 90% were children. Rosa died at the age of 44 on 1 Feb 1869. When she died, only three of her children were alive. By the time Felicianno died in 1884, only two were surviving. My great grandmother, Maria, and her brother, Jose. I don’t know Rosa’s cause of death, but if they had written down heartache I would not have been surprised. I can’t imagine what it would have been like for her to watch one child after another pass away. She lost three children in 1863 alone. She may be a strange candidate for tough woman since she only lived to 44. I can only imagine the emotional pain that she carried with her. She gave birth to her first child in 1841 and her last in 1864. The fact that after each child died she continued to get pregnant and try again says something about her and her inner strength. Or, perhaps I choose to see it that way. I think it was a tough life, with much suffering. That is why she wins the award for tough woman in my tree. No one should have had to endure what she did, but I know, many have. You are doing awesome on your research, It must have been heartbreaking like you said to lose so many children when they were so young and before you pass away at a young age. Life was pretty rough for people back then. Thank goodness the church kept great records. My Grandfather’s brother Albert married a lady who had a daughter from her former marriage and he raised. Bernice married Charles Borba Azevedo who’s father Manuel Borba Azevedo was born in Norte Grande, St. George Is, Azores in 1880. Manuel wife father Joseph DeCosta was born in Madeira Island. Joseph married Maria Joaquina Amelia who was born in 1853 in Pico Island Azores. My cousin who was a direct grandson of my Grand Uncle had done all the searing for the records and wonderful photos! I love all the stories. I hope you have fun with the rest of your search. I usually work on research 4 times a week. Great story Melody!